The first round of the 2019 NI Championship kicks off back at one of the early major stomping grounds of The RSA at Aghadowey on Saturday the 13th April. This is a superb rally venue where many of the current crop of Irish Rally Championship contenders had their first taste of motor sport competing in The RSA Nova Challenge. For the 2019 Championship we are creating a new series for drivers of normally aspirated Mazda MX5 cars and also included is The Irish Mini Cup together with another tarmac championship for the three classes of Race Buggies. We continue to welcome 'junior' drivers from 12 years of age into properly built machines into Rally car class 1 for competitors in cars which are 10 years and older with engine capacity of a maximum of 1250cc. We also have class 2 for adult competitors in cars of the same specification which and as all classes can be 'dual driven', family and friends can enjoy a double helping of fun and driver coaching in one event. The RSA Mini Cup concept continues to grow from strength to strength as an an all Ireland series incorporating the class 12 North and South Ireland Championships both in the Winter and Summer Championships and is continuing to enjoy growth from 'new' junior drivers from 12 years of age competing in identically similarly prepared 135hp Mini Cooper and modified Mini One cars. If the past RSA form continues, some of the current competitors in this unique formula and in the Winter only 'Ryan Bradley Micra Challenge' will make a positive impact into the future of Irish Motorsport. The RSA now offer additional Rally car classes to include, one make formulas, front, rear, 4 wheel drive, turbocharged and now electric/hybrid and diesel vehicles to enjoy the RSA professionally provided, unique competition formula, of hassle free, and enjoyable rally sport. The first edition of the entry list for the Round One of the 2019 RSA NI Summer Championship event at Aghadowey next Saturday the 13th April is now available through the Entry List link at the top of this page and will be updated daily as we approach the event. The gates to the next venue at Aghadowey Motorsport Centre will be open from 7.30am with signing on and scrutiny will commence at 8.00am. The drivers briefing will take place at 9.50am with the 'sighting/observation run' immediately thereafter. A scheduled seven stage runs are on the menu with the best five determining each competitors score. The prize giving for the event will take place 15 minutes after the last car finishes. The dates and venues for all the Irish and NI Winter and Summer Championship events are detailed below. The final Irish and NI Winter Championship points are available through the Results link at the top of this page. The RSA Winter Mini Cup and The Ryan Bradley Micra Challenge championship points are also available. The images on this website have been generously provided by Raymond Elliott of RJ Pics and Eamon Ponsonby of EP Photography. E-DRIV PRO is the latest and best home race simulator cockpit money can buy, designed by real racing champions to give you the advantage over your competitor when racing on-line. Upgrade to the E-Driv Pro race simulator system today and take your e-racing experience to the next level. With multiple options and third-party add ons, find the perfect home racing simulator setup for you! Attention all RSA competitors the Free Entry Draw opportunity worth £100+ closes for every event on the preceding Wednesday at 10.00pm so if you intend to compete at an event it is advised to make your entry before the preceding Wednesday to qualify for this draw. Entries will be accepted right up to the Drivers Briefing on event mornings but ‘late entries’ will not be included in the draw. Making a forward entry costs nothing and is so easy for you ‘the competitor’ but it really helps us organise our events efficiently, ultimately creating more stage miles and giving YOU more driving time and enjoyment from the event..
We wish to remind ALL competitors of the importance of the need to comply with our IOPD standards in relation to safety race wear AND THE AGE OF PERMISSIBLE PASSENGERS/CO DRIVERS which can be found in our website under general regulations. Please be advised that the appropriate motor sport race wear is required at all RSA events and any competitor who cannot fulfil this requirement and any competitor found to try to compete with an inappropriate aged co driver under the age of 17 in any event will be immediately excluded from competition WITHOUT ANY RETURN OF ENTRY FEES. For detailed build specification for the Micra Challenge Cars please contact the series regulator, Aaron McLoughlin on 00 353 (0)87 2103604. A selection of 2018 Rallysport Association personalised clothing and entry gift vouchers and other products and options are now available from our new on-line store which can be entered through the SHOP link at the top of this page. 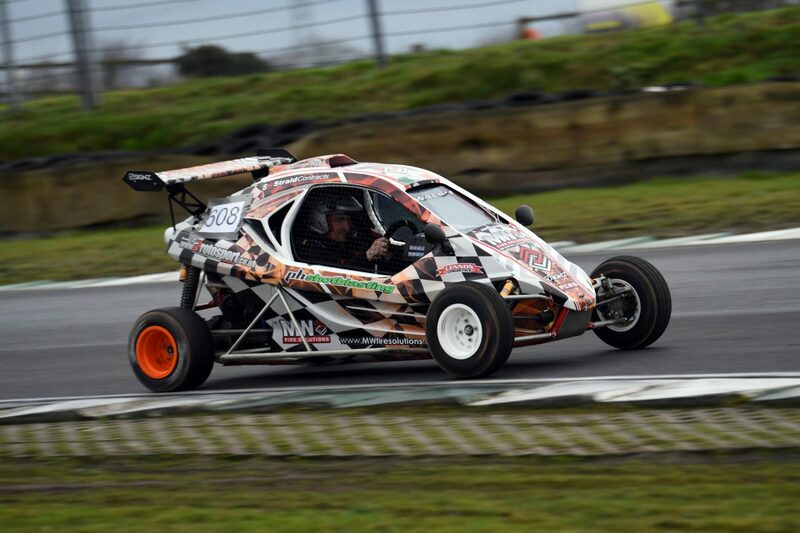 The featured driver below is The Irish Open Race Buggy Champion 2019 – Mac Walsh – 2018 Speedcar Xtrem 750. Aghadowey as you’ve never seen it before! The next events on our calendar will be the first rounds the 2019 NI and Irish Championship on Saturday the 13th of April at Aghadowey Motorsport Centre in Co Antrim and at The Pallas Motorsport and Activity Centre in Co Galway on Sunday the 5th May. The dates and venues for our two Championships in Ireland this Winter are published below and we welcome regular entries together with casual entries at ALL our events. We also welcome experienced competitors along with newcomers together with first time competitors and juniors (12 yrs +) to sample the unique and enjoyable experience of a Rallysport Association event. The next event on our calendar will be held on Saturday the 13th April at The Aghadowey Motorsport Centre which will be the first round of The 2019 RSA NI Rally Championship. It will also be the the first round of the ALL IRELAND ‘e-driv Pro’ 2019 RSA Mini Cup. Entries are available through the On Line Entry link at the top of this page. Entries can also be made by email at info@therallysportassociation.com, via Facebook Messenger at the Rallysport Association and Alan Hyde Facebook pages and by text or phone on +44 7788 (0) 7788 598461. Please be aware that the demand for entries at recent RSA events have recently exceeded availability and the arrival of competitors who want places at the last minute has caused us event management problems. As a result, and in order to be fair to ALL competitors we have necessitated a few changes so please be advised of them. On-line entries received up to 10 pm on the Wednesday prior to our events which are accompanied with payment WILL ALWAYS BE GUARANTEED AN ENTRY. Entries made via email, watsapp and text will require a non refundable deposit payment of £20 to secure the entry place which will be deducted from the entry fee payable at signing on. Entries made by phone will require credit/debit card details to supply the non refundable entry deposit of £20 to secure the entry place which will be deducted from the entry fee at signing on. When the maximum entry level for each event has been obtained with paid/deposit paid entry fees ADDITIONAL ENTRIES WILL NOT BE ACCEPTED. However an entry ‘Reserve List’ will be created and entries on this list will be accepted and deposits will only be authorised when entry places become available. The first edition of the entry list for the event at will be available on Wednesday the 10th of April and will be updated daily during the remainder of the week leading up to the event. All entries received before 10pm on the Wednesday preceding all RSA events will automatically qualify for inclusion in the ‘Free Entry Draw’ which can be worth up to £100/€115 which will take place at the end of the drivers briefing. These early season events always attract many casual entries for shakedowns and testing so we strongly recommend that entries should be made sooner rather than later for places to be guaranteed. Entries can be made on-line through this Enter Online link, on Facebook Messenger or by phone or text on our direct entry number (0044) 7788 598461. The gates to the venue will open at 7.30am. Signing on will commence 8.00am in the reception building and scrutiny will take place from 8.10am at each competitors service area. Please ensure all cars have been cleaned for this event and race wear and helmets for car crew satisfy RSA technical and associated regulations (available on this website) and are available for inspection at scrutiny. Noise testing may also be taken so please ensure vehicles can satisfy the maximum permitted RSA noise regulation of 105 dba measured 1 metre from the exhaust end at 3500 rpm cars and 6000 rpm for race buggies. A sighting lap for each crew will start at 10.10am and the first stage of a scheduled seven will follow immediately after. The prize giving for this event will take place 15 minutes after the last car finishes and everyone is invited to attend. The final results will be available here for download by 6.00pm that evening. We wish to thank all competitors and friends and spectators for their continued support and wish them good health and happiness in 2019 . Online entries are simple and reduce competitors administration time on the day and are welcomed in winter and spring time. Phoned or text entries can finish the entry process by completing the entry form at ‘signing on’ on the morning of the event. Seven of the eight rounds of the NI events will count towards the 2018 RSA NI Summer Championship honours. Six of the seven rounds of the IRL events will count towards the 2018 RSA IRL Summer Championship honours. The best seven of the eight rounds in the NI Championship 2019 event calendar will count towards championship points and the awards will be presented for the RSA NI Championship 2019 at the final round at Nutts Corner on 6th October. Seven of the eight rounds of the NI championship events will count towards the 2019 RSA NI Championship honours. Entries are always welcome with us for just one event, a few events or for the full championship and casual and new competitors are always very welcome. Six of the seven rounds in IRL events will count towards the 2019 RSA IRL Championship honours. THE RSA 2019 RSA MINI CUP. Info to be published soon.